It’s apparent from the survey of [c]MOOC technology that course teams are taking a loosely joined set of tools that they are comfortable with to facilitate a shared experience with the learner. Even with the bespoke nature of [c]MOOCs there are still opportunities to start collectively raiding the parts bin. … Given the wide use of WordPress … are there opportunities for [c]MOOC specific themes or plugins? At the time I highlighted the prevalence of the FeedWordPress plugin for WordPress, which is used to aggregate content from other sites via RSS feeds. Six months on and reading posts mainly from Alan Levine the WordPress parts bins has well and truly been raided. Alan is at an advantage having been involved with the open online course in Digital Storytelling (DS106) and it’s been incredibly useful to see how his recipe has evolved. At the same time others have been turning to WordPress to support their courses. Of note are E-learning and Digital Cultures on Coursera (#edcmooc) , which challenges the division of connectivist (cMOOC) and instructivist (xMOOC) by using the FeedWordPress recipe; and the Open University/OpenLearn/Martin Weller course in Open education (H817). One last plea – I joked with Alan that I needed DS106 out of a box. I think I’m serious though – it would be great to have a step by step, idiots guide to installing and setting up a DS106-like environment. The rest of us don’t have Alan and Jim’s tech skills, so getting to the starting line is difficult. I know they’ll say you should invent your own way, but they done so much great work that I don’t think they realise just how much expertise they have. A simple installation that let the rest of us get started, would mean we could all go off in different directions then. So any of the DS106 crowd up for it? And I do mean a simple guide, it has to be Weller-proof. Personally, and at the danger of frustrating Martin further, I think it needs more than just a guide. In my original post I highlighted how aggregation of data was key. This still holds but with all data the next challenge is turning it into something actionable. What pathways might be useful for users to make sense of what is going on. Looking at H817, EDCMOOC, DS106, ETMOOC and others you have a lovely, gorgeous, wonderful flow of creativity, ideas and reflections, but often this is hard to navigate. Even when you use post excerpts a page of the last 10 posts is at best over 3,000 pixels long. Add in the issue that you might be pulling in content from 100s of sources and those 10 posts could quickly disappear. Taking a step back a considering what FeedWordPress is doing, its a feed aggregator so are there any cues we can take from feed readers to make it easier to users to browse the content. That was the question I found asking myself when I was recently asked to contribute to ALT’s Open Course in Technology Enhanced Learning (ocTEL) [starts 4th April – still time to sign up]. Take Google Reader for example (don’t even get me started on Google’s ridiculous decision to close this in July). Reader is able to allow you to easily browse 10 posts in 300 pixels and if there are over 10 posts as I scroll down more content is automatically added. If there is anything I look the like of I can click the title to get the content. I can also see the things I’ve read and options to ‘star’ and share (although sharing has been compromised with the introduction of Google+). Feeds can also be organised into folders making it easy to filter content. I’ve got more tidying up to do with the code before official release but you have have a play here (if you want to test read/favouriting then register here) and here is the current code (very poorly documented). When I started making this custom child theme Google Reader was going to live to a merry old age. Given it’s death in July and having already started my search for a replacement I’m wording if reusing this recipe and my existing feed subscriptions might be the way forward – particularly as the base theme is responsive and works well on mobile. Taking this idea one step further there are potentially some interesting collaborative opportunities beyond an open course context. In particular I was thinking of enabling the WordPress commenting system which would allow discussion of posts, the scenario being your team want to monitor and comment on a set of feeds (I’ve disabled commenting for now as I want people to discuss content on the source post, the issue though is the comment activity is not captured and displayed … one to add to my TODO). One of the things at the forefront on my mind is this is potentially an open course platform in a box, but the box contains a random selection of pieces and no instructions. The guidance can be written, its finding the balance between ‘flat pack’ and bespoke. This is really exciting, Martin- I was thinking if there is one person who can rise to Weller’s challenge it is you. I am very intrigued by the idea of the community favorites as a way people’s reading activities could help bubble content upward. Until know I thought really the role of the site was to be the accumulator, and rely on using gReader as the better way to browse, but am seeing now its possible to do that in the hub site. Maybe Google’s move is a good kick in the arse. Is it loading the post dynamically via ajax? Would this be quicker if the content was already aggregated in FWP? Or it could be done w/o FWP maybe for a smaller set of feeds? We did have some code on ds106 that loading the post count on a remote site, if there was a comment RSS feed (mostly WP), but it was sluggish to do it in real time. Was pondering if this process could be cached somehow, at least to have an indication of comment count always seemed useful. Looking forward to seeing what else you are cooking up. >Is it loading the post dynamically via ajax? yes but pulling the FWP content so hopefully it’s quick. Having got an email from my hosting company saying I was over using resources I might revert to pre-populating the content as it’s all happening in the_loop anyway. At the end of the day I guess it’s a balance between CPU and bandwidth. The commenting thing is a “nice to have” but falls apart with platforms outside of WP, as well as for blogs using things like disqus. Hi Martin, really interesting post there, thanks. I’ve been attempting to build online courses in WordPress for a while now. I use WordPress for most of the sites I build these days, so I always tend to gravitate towards it first before trying anything else. I find a lot of the membership plugins a bit lacking though, so it’s really tricky to be able to create areas of the site that people have to log in to (I would want them to log in so that when they interact their profile data show’s up, even if it’s just a profile pic). Have you found any plugins that help with that in your travels? Is there any reason why you think it would be better to use WordPress rather than a custom Moodle install for this? 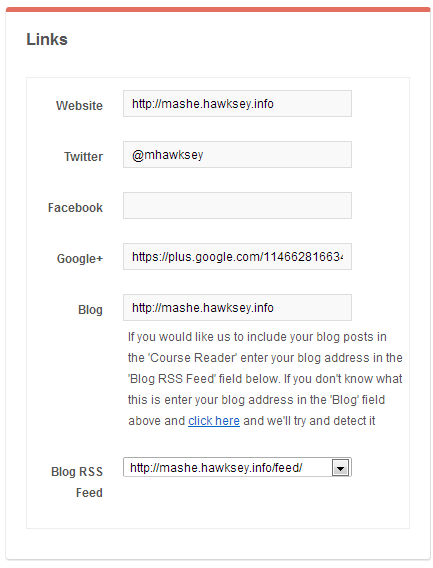 Moodle’s just about as easy as WordPress to set up and is ideally suited to running massive open courses. It’s possibly a bit overkill for a one-shot MOOC, but I’ve found ways of simplifying it over the years. Would value your input on that. Cheers, and keep up the great tinkering! I’ve been discovering similar issues with membership. It at this point we start hitting the WP cons with very fiddly recipes and loosely joined plugins. Currently I’m using ‘Theme My Login’ which has some nice modules for registration approval and removes the default login window. 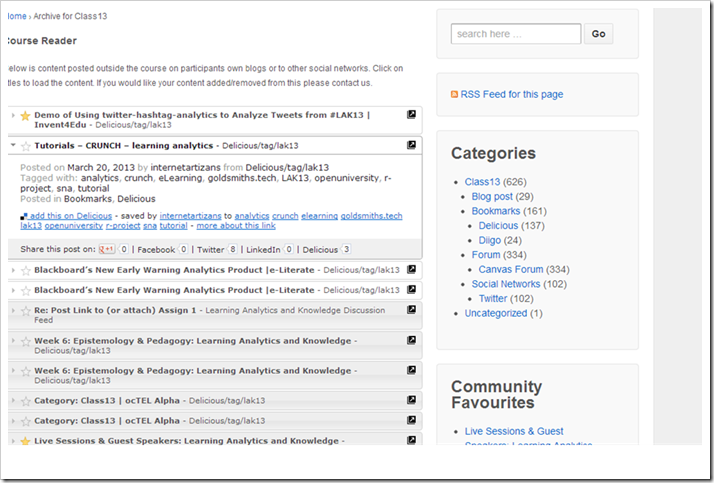 Next using bbPress for the forums had a nice double win as it lets you have public profile view/edit pages like http://octelalpha.hawksey.info/forums/users/admin/ – downside of this is I’ve had to do a lot of customisation, but hopefully given the code is out there reusable. As for WordPress/Moodle there’s probably a lot of personal preference in the platform. I also think there are some benefits of starting with a cleaner base, less tables to get lost in, clearer documentation, huge developer community. Also my main interest is in aggregating and disseminating user generated content which might be a closer fit to wordpress. Certainly worth remembering that the early Downes/Siemens model was gRSSHopper and Moodle so there may be instances where the decision isn’t one or the other. I haven’t come across ‘Theme My Login’ so will have to have a look at that. I’ve used the commercial Plugin ‘White Label Branding’ a lot in the past and it’s perfect for that type of context. It allows you to customise your login page, and a whole lot more on the admin side besides. It’s great for sites where the members will see the dashboard as you can set the options that appear, put your own logos in there and put in custom widgets for instruction and direction. I’ve had a similar experience with bbPress – really powerful, but needs a lot of CSS and template tinkering to get it looking half decent. 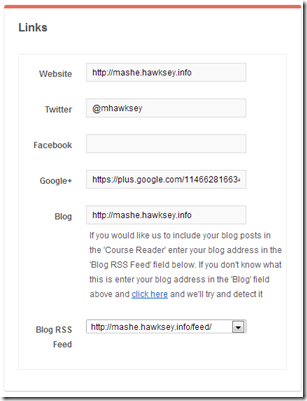 You’re right too about Moodle – WordPress’ community blows it out of the water and I wish sometimes for the range of plugins and customisation you get with WP. I also wish it was just a bit simpler to hack. The template and functionality just aren’t half as easy to mess around with. This looks great and a major step forward for users to access and share “stuff” – wish there had been something like this for #edcmooc. LOL Sheila – a great comment and a great visual to boot!! Would it make any bandwith difference if you changed your approach to avoiding the preview option – bringing in a snippet and when you click on it – you get a new window that has the original context for the item? Basically, a big list with links. I understand the want to have the preview ala Google Reader, but maybe to save on bandwidth, just provide a link out (or the ability to save to Delicious or repost to Twitter as opt-in options). Either way, awesome work, I will be interested in how it matures. Why not use a wiki? So easy to use. http://ceetopenwiki.wikispaces.com/ I added a Google Community (like etmooc) for a discussion thread instead of using their discussion thread option. 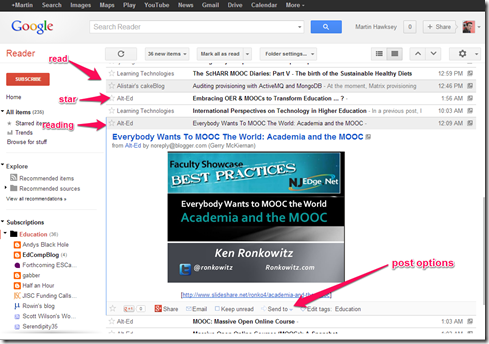 I “hear” that wikispaces newer more mobile version coming out ASAP? This is genius. I’ve been thirsting for this functionality. I’m working with the Commons in a Box wordpress package; I would love to add community-based feed reading to my courses. Using the human bot-net to cover a disciplinary specific set of feeds would be an amazing pedagogical tool. Now, if you could just add an everything-all-in-one (posts/forums) voting mechanism that feeds into a tag-based social-reputation profile a la stackoverflow AND wrap it up in a package like Commons in a Box … heaven! I’d offer my vote for the nobel prize in open education!